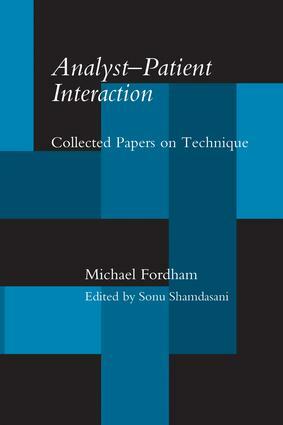 Michael Fordham was a friend of Jung, made many major contributions to analytical psychology. This volume brings together his key writings on analytical technique. They are important because they have shaped and informed analytical technique as we find it today. These writings will be welcomed by both trainee and practising analysts. Introduction. Notes on the transference (1957). Counter-transference (1960). Suggestions towards a theory of supervision (1961). Reply to Dr Edinger (1961). A comment on James Hillman's papers (1962). Problems of a training analyst (undated). Reflections on training analysis (1968). Technique and counter-transference (1969). Reply to Plaut's 'Comment' (1970). The interrelation between patient and therapist (1972). Jung's conception of transference (1974). Defences of the self (1974). Analyst-patient interaction (1975). Discussion of Thomas B. Kirsch, 'The practice of multiple analysis in analytical psychology' (1976). Analytical psychology and counter-transference (1979). Contribution to symposium. 'How do I Assess progress in supervision?' (1982). How I do analysis (1988). Fordham's rejoinder to Spiegelman's comments (1988). The supposed limits of interpretation (1991). Rejoinder to Nathan Schwartz-Salant (1991). On not knowing beforehand (1993). Sources. Bibliography. Index.